In this work, we present a biocompatible one-pot processing route for ceramic/hydrogel nanocomposites in which we embed live bacteria. In our approach, we fabricate a highly stable alginate hydrogel with minimal shrinkage, highly increased structural and mechanical stability, as well as excellent biocompatibility. The hydrogel was produced by ionotropic gelation and reinforced with alumina nanoparticles to form a porous 3D network. In these composite gels, the bacteria Escherichia coli and Bacillus subtilis were embedded. The immobilized bacteria showed high viability and similar metabolic activity as non-embedded cells. Even after repeated glucose consumption cycles, the material maintained high structural stability with stable metabolic activity of the immobilized bacteria. Storing the bionanocomposite for up to 60 days resulted in only minor loss of activity. 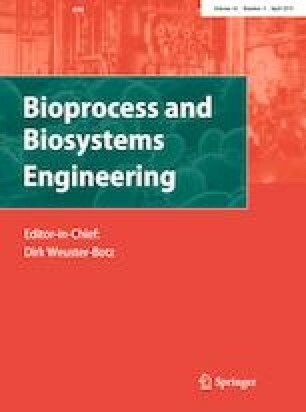 Accordingly, this approach shows great potential for producing macroscopic bioactive materials for biotechnological processes. The online version of this article ( https://doi.org/10.1007/s00449-019-02119-4) contains supplementary material, which is available to authorized users. We would like to thank DFG Research Training Group GRK 1860, ‘Micro-, meso- and macroporous nonmetallic materials: fundamentals and applications’ (MIMENIMA) for funding.